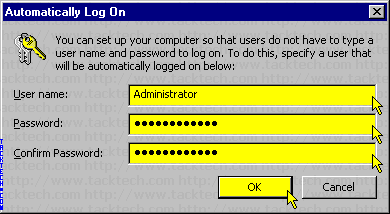 Automatic logon for Windows XP Professional (Windows XP) - TACKtech Corp.
Set a computer running Microsoft Windows XP Professional (Not Windows XP Home) to automatically log on. This bypasses the Welcome screen. 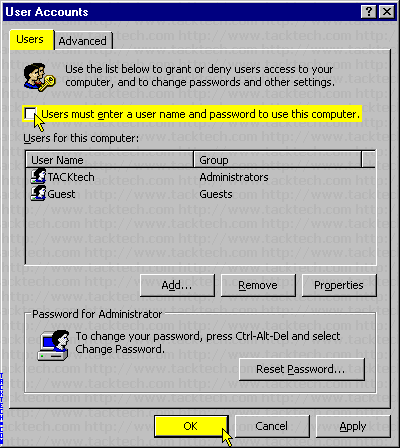 Note: Enabling the auto logon feature on a PC will allows other users to start the computer and use the account that is set to automatically log on. It is not recommended using auto logon on publicly accessible computers or portables as it poses a security risk. Type control userpasswords2 in the Open: box. Clear the Users must enter a user name and password to use the computer. checkbox. Type the user name in the User name: textbox. Type the user's password in the Password: textbox. 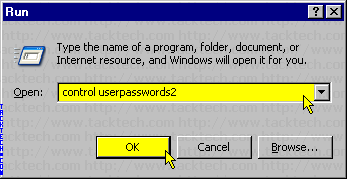 Type the user's password in the Confirm Password: textbox.